Boots with a composite toe are popular work shoes for farms and other heavy-duty industrial jobs. They are lighter than steel toe boots while still delivering the same level of toe protection while you’re on the job or working on the farm. We’ve done our research to bring you only best composite toe shoes available on the market right now. First, here are some things you should keep in mind while you shop. Type: There are two main types of boots represented on this list: pull-on boots, which don’t have laces and you can pop on your feet whenever, and lace-up boots that tie onto your feet with the help of laces. Color Options: What colors are the boots available in? While this is mostly up to you, you might have to choose a specific color for work or a uniform. We’ll tell you how many different options you have for your boots. Rubber Sole: A rubber sole can help absorb the shock from steps, and it can help you stay stable in slick conditions. We’ll let you know here so that you can make the best decision for you. Waterproof: Some of the shoes on our list are completely waterproof, meaning that they will stop water from getting to your feet completely. Some are merely water resistant for damp conditions, so we’ll let you know. EVA Midsole: EVA molded foam provides excellent support and can even keep your feet from hurting after long days on the job. We’ll let you know if the boots have EVA midsoles for extra cushion and protection. Weight: How much do the boots weigh? The last thing that you want is to be walking around in heavy boots all day. We’ll tell you how much they weigh as a pair so you know what you’re getting. Now that you know everything there is to know about these boots, we can show you the top rated composite toe boots that we found during our research. We’re sure that your next pair of composite toe boots is somewhere on this list. The top pick and budget pick are our personal favorites, so give them a try before taking a look at the rest of them! They are all pretty amazing boots. The best composite toe boots that we could find were these Boondock Boots by Timberland. Timberland is a huge company when it comes to work shoes, so these boots are in good company. They are made of leather, with a synthetic sole. These boots have a completely waterproof membrane inside the leather, and the leather itself is waterproof as well. Your socks will always be dry with these boots. The footbed and midsole are both made of dual-density polyurethane foam to help reduce foot fatigue and keep you comfortable throughout the workday. The toe protector is a molded rubber that will repel impact and is shaped for the best comfort. You can get soft toes in this boot too, for your everyday life. 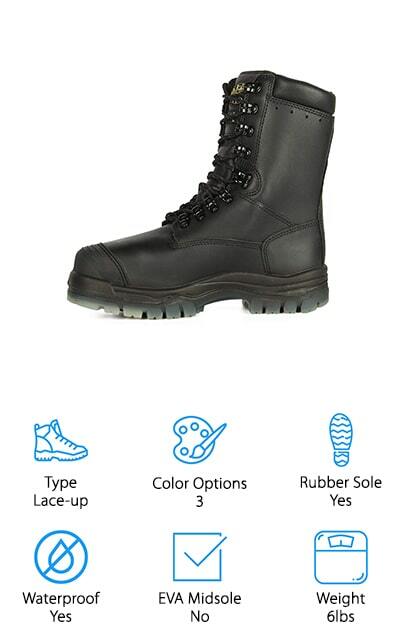 You can even order boots with optional insulation for cold jobs! You have so many options; you can truly make these boots exactly how you want them for your best-feeling feet. 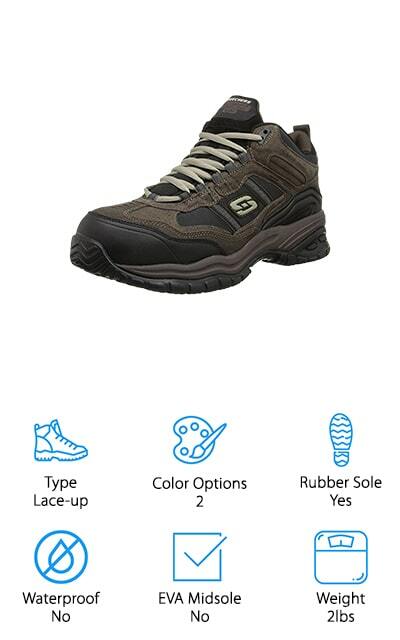 Our choice for the best pair of cheap composite toe boots is this one by Skechers. You might think that Skechers only made sneakers or kid’s shoes, but that isn’t the case at all. These canopy work boots have a rubber sole and a heel that platforms up to 1-inch to keep your feet out of wet conditions. 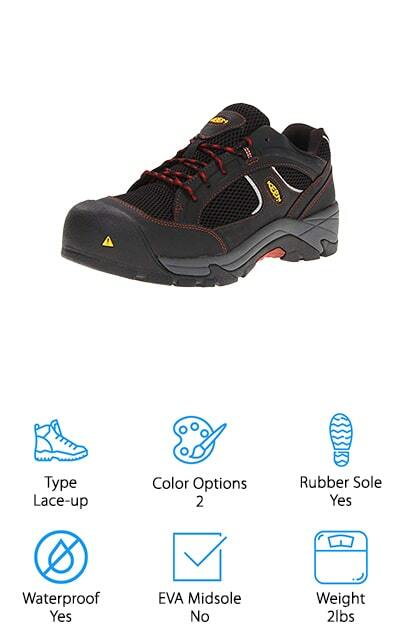 The safety toe is molded well, and that makes it a great safety shoe. The uppers are made of scuff-resistant leather, with mesh panels to keep air circulating around your foot. This also makes them great breathable composite toe boots, which is sometimes a difficult combination to find. The collar and tongue are both padded for additional comfort, and the lining is smooth to keep the fit relaxed and feeling great. The sole is slip-resistant and resistant to oil and chemicals as well. For the price, you can’t beat the quality of this Skechers composite toe boot. Ariat is another great company that is known for their work boots, these Workhog boots are just another great example of shoes from their line. These boots are made of premium full-grain leather that is completely waterproof. All of the parts of the design and construction of these boots aims to make them completely sealed once you put them on, keeping your feet and socks dry no matter how wet it is outside. The outsole is made of oil- and slip-resistant Duratread that will keep you on your feet no matter how slick it is. The midsole is supportive EVA foam that makes sure your feet feel great and continue to feel great throughout your workday. 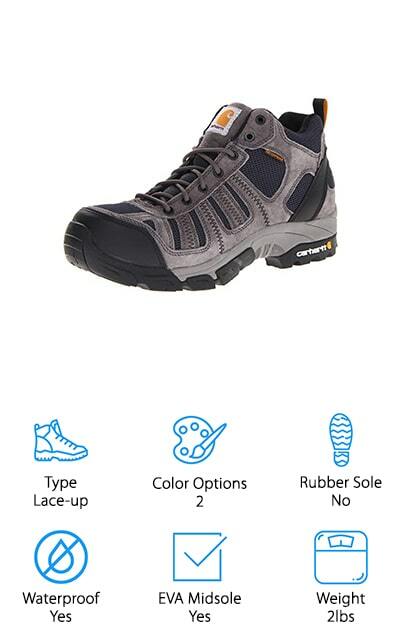 The composite safety toe is non-metallic and gives you great protection while weighing much less than a steel toe. Whatever type of work needs to be done, these comfortable composite toe boots will support you and keep you going. When you think of Reebok, you generally think of sneakers and sports shoes. But they also make these Work Duty Tactical Boots. 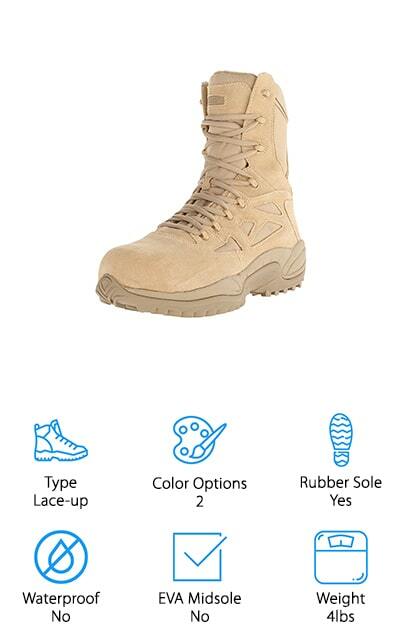 These boots come in two different colors, a tan for desert tactical wear and a green for pairing with camouflage. These boots lace up tight with a side zipper for quick removal; otherwise, they grip your feet in a supportive and secure manner. They are certified to protect against electrical hazards and include an extra-wide toe cap for heavy-duty work. They come with cushion inserts made of polyurethane foam that you can remove and replace with your own if you feel like it. The heel is made to eliminate any shock that might come from your steps, so your feet remain comfortably nestled within the shoe and won’t hurt after long days. They are made of suede leather and nylon, so they are flexible as well as looking the part of a tactical boot. KEEN is behind these Flint Work boots that are made with utility work in mind. The sole is rubber while the upper is 100% genuine leather. What we love most about these boots is the fact that they are ankle-cut, so compared to the other boots on this list they are low cut composite toe boots. The tongue and collar are padded for comfortable wear, while there are mesh side cutouts to make this shoe lightweight and breathable. The midsole is made of a supportive, cushioned dual-density foam, so you’re going to feel less fatigue associated with being on your feet all day. The footbed is removable so you can put your own favorite insoles in, and the sole is non-marking for all different types of utility work. We love how breathable these shoes are, and how protective the safety toe is. Everything about these great shoes is comfortable and functional at the same time. Carhartt are, unsurprisingly, the company behind some of the top composite toe boots that you can find right now. 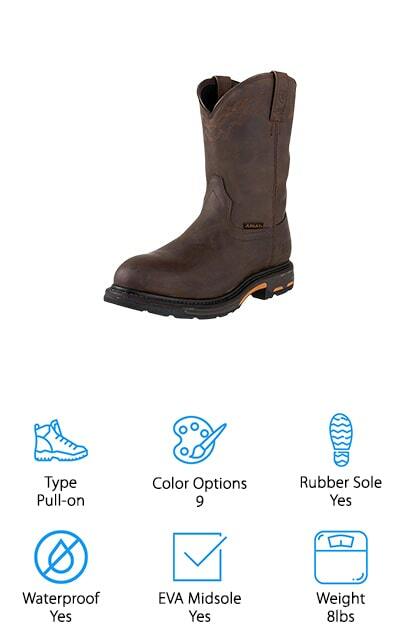 These particular work boots come in a single color option and are made of 100% natural leather. They are extremely flexible, so they move and stretch with you that you can do what needs to be done without being held back. The EVA midsole combined with the unique OrthoLite insole gives your feet the best treatment you’ll find in a work boot. The full-grain leather uppers provide water resistance to keep your feet dry. The rubber sole absorbs shock and values traction above all other features, allowing you to stay stable on slick surfaces. They are constructed with quality materials that will last you a long time, even if you wear them off the job as well as at work. Did we mention the beautiful oil-tanned brown leather finish on the uppers? These shoes look and perform great! These work boots by Keen Albany come in two different color options so that you can accessorize the way you want to. The Nubuck leather upper is completely waterproof and made to keep your foot dry no matter what conditions are like outside. 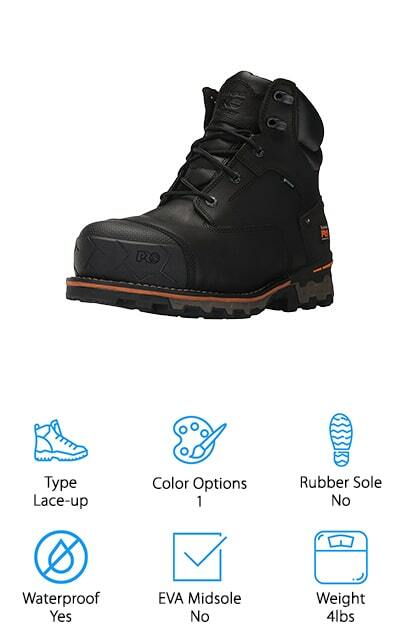 The rubber sole is non-marking and oil- and slip-resistant so that you won’t be sliding all over the job site. You can rely on these shoes to help you get your work done. The asymmetrical composite toes are more comfortable than standard ones so that your toes don’t rub against the harder material and cause blisters. The midsole is a unique vinyl model that is compression-molded for support, and the shank is made of polyurethane to offer a mid-foot support that some other boots don’t. We love the comfort that these shoes offer, as well as the great price and beautiful finish on the leather upper. We know that you will too! Carhartt is back on our list again with these great composition toe boots. They are comparable to Wolverine composite toe boots in every way, and in some ways even surpass them. The main thing that sets these boots apart is the fact that they are extremely lightweight. They weigh just about a pound each. That makes these boots great for long hikes, especially through hikes that last several days. The upper is made of leather and nylon. Inside is a completely waterproof, breathable membrane that will keep your feet absolutely dry. The composite toe is cushioned so that your toes don’t rub on these long days. The EVA midsoles are shock-absorbent and provide support. They’re backed up by a synthetic sole that’s durable enough for everyday wear and rugged enough for the backcountry as well. The inside is lined with moisture-wicking materials to keep sweat away from your foot, and includes a soft insole for optimum comfort! Oliver makes these insulated work boots that use the Thinsulate lining system for comfort even in subzero temperatures. If you need a hiking boot or work boot for long days in extremely cold weather, these are the boots for you. They even include a SympaTex waterproof membrane that keeps moisture out while allowing air in, keeping your feet cool and comfortable throughout the day. They are lightweight shoes, weighing about 3 pounds each. On top of all of that, they are extremely comfortable, with the polyurethane midsole and shock-absorbing properties. The upper, which is chiefly made of leather, resists all oils, alkalis, acids, oils, and even animal fats. Whatever you need these shoes for, they are more than up to the task. Plus, they are rated for electrical hazard and resistant to heat up to 266 F degrees. These boots can handle whatever you throw at them, whether it’s the elements or long days on your feet. DDTX makes these microfiber leather composite toe boots. They are equipped with a rubber sole that also contains EVA foam to boost shock absorption and resist slipping in conditions that might otherwise make you lose your footing. The traction of these shoes is amazing. They are made with long work days or long hikes in mind because they come with deodorant insoles that give you comfort, reduce fatigue, and keep odors down. There is a mesh lining on the inside to allow your foot to breathe and increase airflow. The uppers have sections of camouflage fabric and include a strip of reflective material specifically for game hunters. You can use these shoes for just about any purpose, and they will work just fine. They are completely non-metallic as well, so they are safe to go through the airport. These shoes are comfortable, high-quality, lightweight composite toe boots so you can feel great after your long days.